In an active area of research known as HIV-1 cure research, the purposeful reactivation of latent/dormant HIV-1 in memory T cells, which induces death of the infected cell or alerts the immune system to the presence of the virus, is known as the “shock and kill” approach. As this approach nearly parallels the intracellular signaling mechanisms that lead to oocyte activation, the activation of an oocyte can also be appropriately described as the “shock and live” approach, a term first used to characterize oocyte activation in our publication. Fig. 1. Proposed mechanisms that connect oocyte activation and latent HIV-1 reactivation. AMPK: AMP- activated protein kinase, MET: metformin, RSV: resveratrol, JQ1: BET bromodomain inhibitor, BRY: bryostatin-1, BZM: bortezomib, RA: retinoic acid, PMA/Io: phorbol 12-myristate 13-acetate/ionomycin, CRV: carvacrol, CPS: capsaicin, AMP: adenosine monophosphate, ATP: adenosine triphosphate, ROS: reactive oxygen species, CaMKK2: calcium/calmodulin-dependent protein kinase kinase 2, LMNA: LMNA gene, HIV-1: human immunodeficiency virus type 1, HGPS: Hutchinson-Gilford progeria syndrome, PLCζ: phospholipase C zeta, PLCγ1: phospholipase C, gamma 1, PIP2: phosphatidylinositol 4,5-bisphosphate, DAG: diacylglycerol, PKC: protein kinase C, IP3: inositol 1,4,5-trisphosphate, Ca2+: calcium. Indeed, the activation of both oocytes and T cells is critically dependent on an increase in the levels of intracellular calcium (Ca2+). This increase in intracellular Ca2+, which is characterized by waves or oscillations, is induced by the action of different isoforms of the protein PLC (PLCζ in sperm and PLCγ1 in T cells), leading to a signaling cascade involving similar proteins in both T cells and oocytes (e.g. PIP2, DAG, IP3, PKC) that ultimately lead to oocyte activation and T cell activation-induced reactivation of latent HIV-1. This similarity in “bringing back to life” both oocytes and T cells points convincingly to the novel observation that the activation of AMPK, a master regulator of cellular metabolism that is activated by a variety of cellular stressors (e.g. increase in the levels of reactive oxygen species, AMP/ATP ratio increase, intracellular Ca2+ increase, etc.) represents a central node that characterizes the beginning of all human life via oocyte activation and the potential eradication of HIV-1 through T cell activation-induced latent HIV-1 reactivation. Before becoming fully mature and released for fertilization on ovulation, oocytes were once “alive” and had to undergo a maturation process initiated by a surge in luteinizing hormone before becoming dormant again. Strikingly, oocyte maturation has been shown to be critically dependent on and induced by AMPK activation and even the production and release of luteinizing hormone itself from pituitary cells is dependent on AMPK activation induced by Ca2+. Similarly, memory T cells that are latently infected with HIV-1 were once “alive” when initially infected by HIV-1 but later transitioned to a dormant state, with the integrated HIV-1 virus also becoming latent along with the dormant memory T cell. Moreover, PMA (a PKC activator) and ionomycin (a compound that increases intracellular Ca2+ concentrations) when combined are extremely efficient in reactivating latent HIV-1 via T cell activation and both compounds have been shown to induce artificial oocyte activation and activate AMPK. Additionally, ionomycin has been successfully used to induce human oocyte activation during intra-cytoplasmic sperm injection (ICSI) procedures, producing normal healthy children. Interestingly, as this publication details, activation of mouse oocytes (models for human oocytes) can be achieved by the application of carvacrol, a compound derived from oregano that activates AMPK as well as receptors on oocytes that detect changes in temperature and facilitates calcium influx into oocytes. Furthermore, metformin and bryostatin-1 (a PKC activator) both activate AMPK and when combined induces latent HIV-1 reactivation in monocytic cells in an AMPK-dependent manner. Metformin has also been shown to improve pregnancy rates observed during human in vitro fertilization procedures. As each of the aforementioned compounds activate AMPK and the deletion or knock down of AMPK leads to T cell death as well as a significant inhibition of oocyte maturation (a process that precedes and is essential for oocyte activation), AMPK activation appears to represent a molecular switch that promotes oocyte activation and latent HIV-1 reactivation, linking the potential eradication of HIV-1 with the creation of all human life. 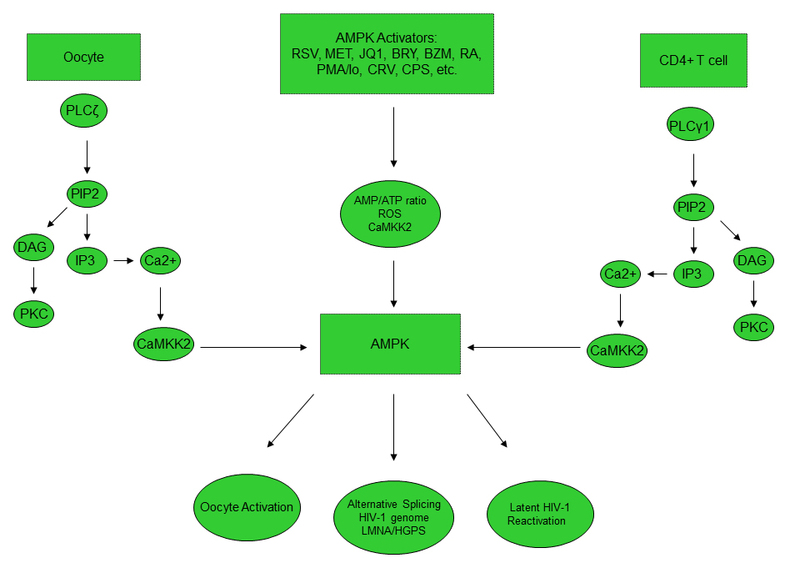 Oocyte activation and latent HIV-1 reactivation: AMPK as a common mechanism of action linking the beginnings of life and the potential eradication of HIV-1.